I have finally read Owen Barders' new paper: "Beyond Planning: Markets and Networks for Better Aid", required reading for aid-policy-wonks. It's pretty heavy going, so here's my attempt at a quick summary/intro/review. The Paris/Accra agenda is failing. And it will continue to fail because of the political economy of aid organisations. NOBODY has any incentive to specialise, do what the recipient government wants, or commit to long-term funding. 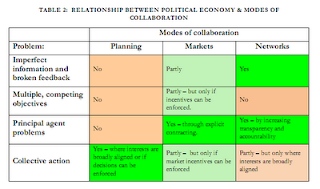 The way to fix these incentives is through adding markets and networks to the mix. Markets by having donors contract out more of aid implementation. Networks by, er, having some kind of wikipedia-facebook-social-network-for-aid-type-thing. Sounds good to me. One thing though, I would have liked to have seen more emphasis on cash transfers to individuals. One of Barder's key problems with aid is the lack of a feedback loop from recipients to suppliers. People in Southern Sudan can't take their receipt back to the UK and say, "er, yeah thanks for the community-peace-building-initiative but I want my money back please". Because in aid, the supplier is also the guy who pays. There are 2 ways to get this feedback. The "short chain" way to make aid more accountable to the beneficiaries is to give beneficiaries more control over the organisations that deliver services. One way to do this is to provide aid directly to the intended beneficiaries – for example, in the form of cash transfers or vouchers. 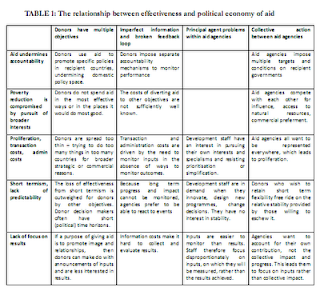 The "long chain" way to make aid more accountable is to give much greater emphasis to transparency, community engagement, measurement of results and feedback through the political system. At which point the short chain is dropped and never mentioned again. BUT BUT BUT then those peasants might just spend the money on booze and fags and dvds! Hmmm sounds like a pretty 'developed' society actually. Thanks for taking the time to read the paper. Your summary is very fair.